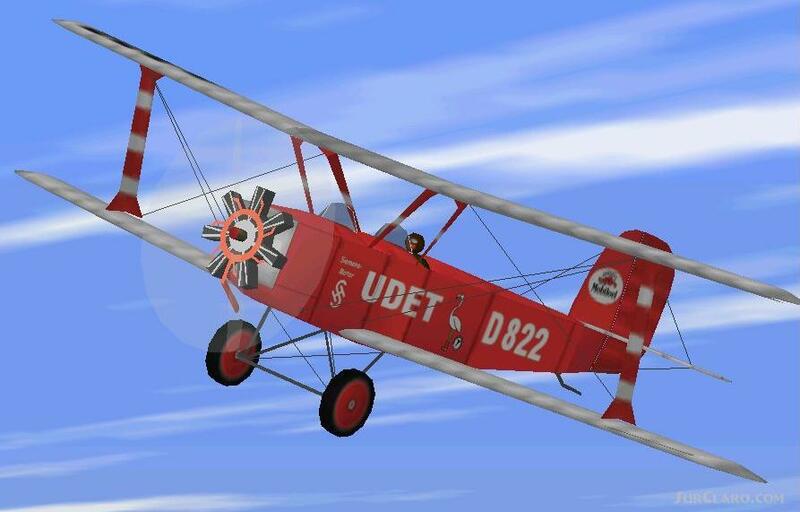 FS98 Udet Flamingo A-12b Spezial 1925. Ernst Udets personal aerobatic version of the Udet A-12 sports biplane, with larger tail rudder and aerodynamically improved wings, built created by Udet Flugzeugbau in Ramersdorf in 1925. It was powered created by a 160 hp Siemens-Halske Sh-14a radial engine, with 86 kt level flight top speed. Later, production of the U-12 was continued created by Bayrische Flugzeugwerke and the aircraft was exported to Austria, Hungary and Latvia, being built under licence in these countries as well. About 200 U-12 units were produced in total. Aerobatic FD for precise manouevers created by Christoph Ruhtenberg. Includes a modified sound. cfg for a deeper default Sopwith Camel sound. Textures created by Udo Entenmann. created by Stephan Scholz. FS98 Udet Flamingo A-12b Spezial 1925. Rating: 10.00 of 10 over a total of 1 reviews.